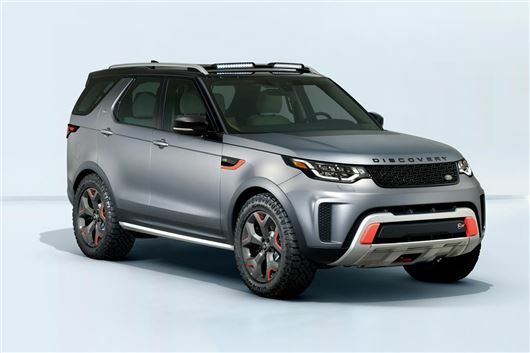 Land Rover has unveiled a high performance SVX version of the Discovery - the car you never knew you needed. Powered by a 5.0-litre supercharged V8 engine it has no less than 525PS. And the price? Expect it to be more than £100,000 when it arrives in 2018. But perhaps of more interest in the real world is the introduction of a 2.0-litre petrol engine in the Discovery range. Badged Si4, the four-cylinder unit has 300PS but it's the 400Nm of torque which should make it a viable alternative to the diesels in the Discovery. Other changes to the recently launched Discovery include a new digital instrument cluster, standard on HSE and HSE Luxury models plus the addition of 4G WiFi on SE models and above. That may explain the huge amounts of power the Discovery SVX has been given. Along with the 525PS there's a hefty 625Nm of torque. But this isn't just for all-out speed. The SVX comes with a new Hydraulic Active Roll Control (H-ARC) system. Land Rover says it's designed to improve wheel articulation and enhance extreme off-road traction while also reducing body roll on-road. Other changes include better approach, departure and breakover angles thanks to raised suspension. It also gets larger - and knobbly - Goodyear Wrangler tyres plus active centre and electronic rear locking differentials. And with a nod to the G4 Challenge models it has produced before, the SVX gets orange detailing, including exposed towing eyes - each rated to two more than six tonnes. There's also an 'anti-glare' bonnet and an integrated rear-mounted electric winch system.